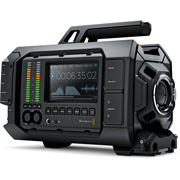 The URSA 4.6K Digital Cinema Camera with active EF Mount from Blackmagic Design features a form factor that is designed to make it flexible enough to use on productions of all sizes. From a single operator all the way up to a full camera crew. At the heart of the imaging system, URSA 4.6K features a 4608 x 2592p resolution, global shutter CMOS sensor with 15 stops of dynamic range. The camera records and outputs in the 2160p format, a 16:9 standard with precisely four times the resolution of 1080p, often referred to as UltraHD.